At the moment I can really feel the onset of winter. The clocks changing always throws me out and leaves me super tired for a few weeks, and recently I’ve been a little overwhelmed anyway. Trying to juggle so many balls, blog, virtual assistant work, studying, Roller Derby and y’know, having an actual life have left me feeling a bit stressed and overwhelmed. I’ve turned back to herbal remedies that have helped me in the past, St Johns Wort and 5-HTP, and I’ve also been trying not to be too hard on myself. At the moment I’m taking a little break from Roller Derby as I injured my ankle again, so I’m feeling a little more breathing room, but I’m also anticipating another super busy couple of months coming up to Christmas helping Reginald Spleen out with fairs and Christmas orders. The upshot of all that rambling, is that at the moment I’m in a little eye of the storm spot. Things are a little quieter, but busy times are coming. 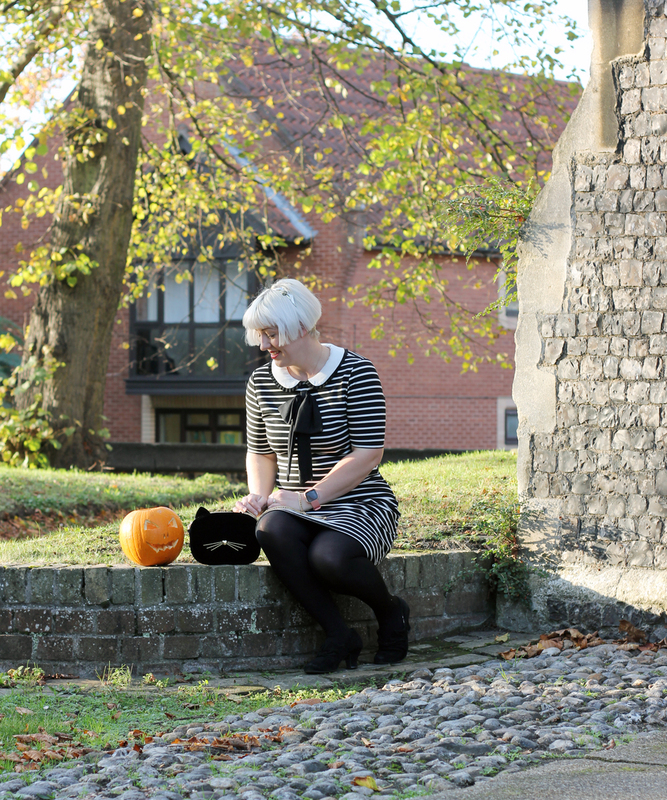 So we took advantage of the moment to go out in the afternoon and celebrate my absolute favourite no obligation holiday, Halloween. We didn’t want to go out in the evening, so all we did was pop into the City in the middle of the afternoon for Cocktails. 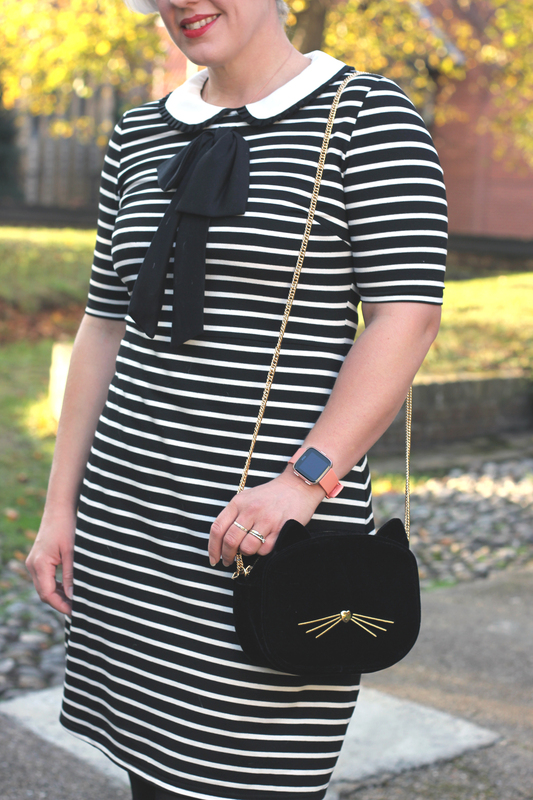 There was no opportunity for a full-on fancy dress costume, but I had to make a nod to the season with the cat bag that I picked up in Primark last week. My dress came from Joanie Clothing. I’d wanted it for ages, but it was out of stock in my size, and then, in the middle of the heatwave this Summer, it came back. I immediately ordered it, and it’s been hung in my wardrobe ever since as it was too hot to wear it in the Summer. 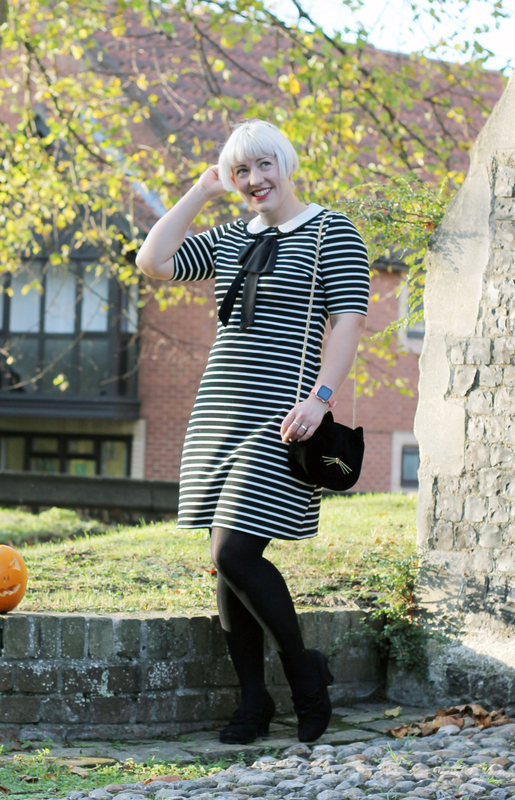 With the arrival of Autumn, however, it’s turned into a comfy and cute wardrobe staple! 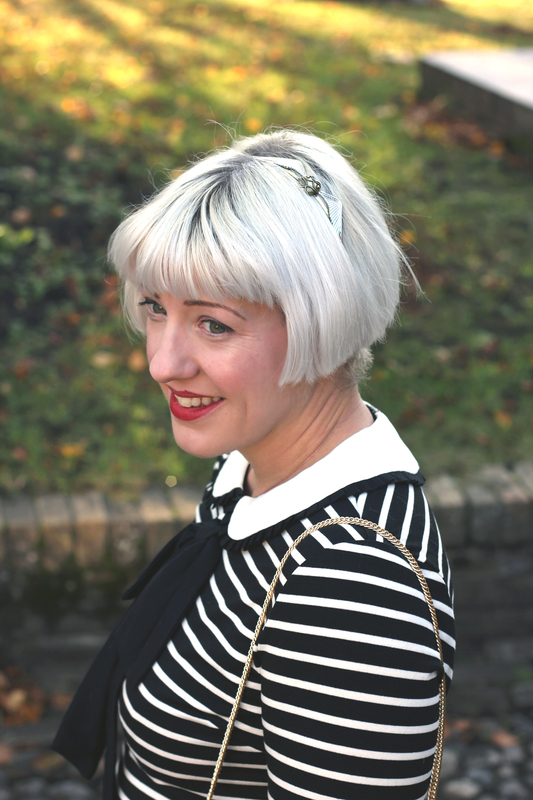 Oh yeah, and that hairband, also from Primark, it’s a Golden Snitch! This year has been a tricky one. It’s been great, but I’ve struggled to find a balance. I feel like I’m not giving anything my best attention and I’m spread too thin. I have ideas for blog posts never written, mostly on the health and fitness side of things, and my own health and fitness has been a struggle to maintain, let alone improve. Sometimes it’s important just to take a step back and give yourself some breathing room. Nothing lasts forever, we have ups and downs. We won’t be the same people next time this year as we are now and we never really know where life will take us. For now I’m just trying to enjoy the ride a little more. 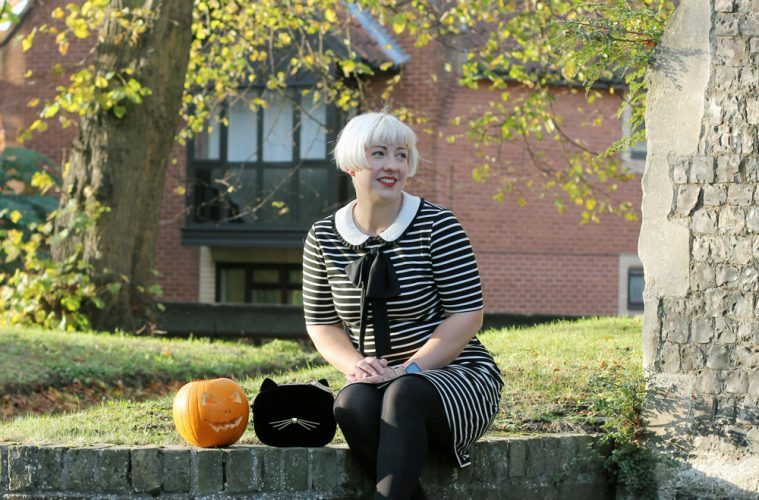 Maybe next year will hold Personal Bests and exciting achievements, but for now it’s enough that there are afternoon Cocktails and pumpkins in the sun. You look so cute <3 Keep sharing stuff and I hope you get over things and start writing again on things you have things. Nice post and nice pictures very interesting and looking beautiful thanks for share. These are lovely pictures. Many thanks for sharing this article.